Let’s go back to direct products and free products of groups and consider them just in the context of abelian groups. The direct product of abelian groups and works as we expect it to, because the elements coming from and already commute inside . The free product of and as groups gives as before, but now this is not an abelian group. Let’s consider the property that defined free products a little more closely. Here’s the diagram. We want to read it slightly differently now. The new condition is that for any abelian group and homomorphisms and there is a unique homomorphism of abelian groups from the free product to making the diagram commute. We know that there’s a unique homomorphism from already, but we need to “abelianize” this group. How do we do that? We just move to the quotient of by its commutator subgroup of course! Recall that any homomorphism to an abelian group factors uniquely through this quotient: . So now is an abelian group with a unique homomorphism to making the diagram commute, it works for a free product in the context of abelian groups. This sort of thing feels odd at first, but you get used to it: when you change the context of a property (here from all groups to abelian groups) the implications change too. Okay, so is like the free product , but we’ve thrown in relations making everything commute. We started with abelian groups and , so all we’ve really added is that elements coming from the two different groups commute with each other. And that gives us back (wait for it..) the direct product! When we restrict our attention to abelian groups, direct products and free products are the same thing. Since this is such a nice thing to happen and because we change all our notation when we look at abelian groups anyhow, we call this group the “direct sum” of the abelian groups and , and write it . Now I didn’t really talk about this much before in the context of groups, but I’m going to need it shortly. We can take the direct sum of more than two groups at a time. I’ll leave it to you to verify that the groups and are isomorphic (use the universal property), so we can more or less unambiguously talk about the direct sum of any finite collection of groups. Infinite collections (which we’ll need soon) are a bit weirder. Let’s say we have an infinite set and for each of its elements an abelian group . We can define the infinite direct sum as the collection of all “ -tuples” where for all , and where all but a finite number of the are the zero element in their respective groups. This satisfies something like the free product’s universal property — each has a homomorphism , and so on — but with an infinite number of groups on the top of the diagram: one for every element of . The direct product , on the other hand, satisfies something like the product condition but with an infinite number of groups down on the bottom of the diagram. Each of the comes with a homomorphism , and so on. We can realize this property with the collection of all -tuples, whether there are a finite number of nonzero entries or not. What’s really interesting here is that for finite collections of groups the free product comes with an epimorphism onto the direct product. Now for infinite collections of abelian groups, the free product (direct sum) comes with a monomorphism into the direct product. The free product was much bigger before, but now it’s much smaller. When all these weird little effects begin to confuse me, I find it’s best just to plug my ears and go back to the universal properties. They will never steer you wrong. If we have a group , it may or may not be abelian. We can measure how nonabelian it is with the commutator subgroup . This is the subgroup generated by all the commutators in . Start with all the elements of of the form with and any elements of . If is abelian, these are all trivial. If is not abelian, is a nontrivial normal subgroup of (verify), so we can form the quotient . This group is abelian. In fact, there’s a universal property floating around. If we have a group , an abelian group , and a homomorphism , there is a unique homomorphism so that is the composition . From this we can see that if is any normal subgroup of with abelian, then . We can repeat this construction. Define to be itself, and . This series of subgroups is extremely important in the classification of groups. If eventually it bottoms out at the trivial subgroup we say the group is “solvable”, which recalls the origins of group theory in finding solutions to polynomial equations. We say a group where is “perfect”. If the series of groups ever hits a perfect group then it stops and will never bottom out, so the original group can’t be solvable. In 1963, John Thompson and Walter Feit proved that a finite group with an odd number of elements is solvable. Their paper ran over 250 pages, consuming an entire issue of the Pacific Journal of Mathematics. If you’re up for it, you can read it yourself. This result really got the ball rolling on the project to completely classify all finite simple groups. The classification is considered by many to be complete, spanning tens of thousands of pages in over 500 articles. Since it’s so huge a body, some people think that no one person can check it all over and thus verify the classification. The controversy rages on. The direct product of two groups provides a special sort of short exact sequence. We know that there is a surjection , and we can build an injection from the identity homomorphism on and the homomorphism sending everything in to the identity of . Since the kernel of the latter is exactly the image of the former, this is an exact sequence . We can do the same thing, swapping and , to get a sequence . If we compose the homomorphisms , we get exactly the identity homomorphism on . When we see this, we say the sequence splits. Let’s look at this more generally. A split exact sequence is any short exact sequence where the surjection splits: . We can identify with its image in , which must be a normal subgroup since it’s also the kernel of the surjection onto . The homomorphism from to must also be an injection — if it had a nontrivial kernel it couldn’t be part of the identity homomorphism from to itself. We’ll identify with its image in as well. Since is normal, it’s fixed under conjugation by any element of . In particular, conjugation by any element of sends elements of back into . This defines a homomorphism . We’ll usually write as The action of on an element of is given by in the group . It’s important to remember that we’re considering and as living inside the same group so that this conjugation makes sense. Okay, so let’s turn this around and build the group up from the outside. We start with groups and , and a homomorphism . We can take the underlying set of to be all pairs with in and in . We define composition by . Verify for yourself that there is an identity and an inverse making this into a group. We call this group the “semidirect product” of and , and write , or just if the homomorphism is understood. If is the identity automorphism on for every , we just have the direct product back. We can also write down generators and relations like we did for the direct product. If has generators and relations , while has generators and relations , the semidirect product has generators and relations . The elements of and don’t commute, but we can “pull past ” to the right by hitting with : . One example of a semidirect product I think about is the group of “Euclidean motions” of the plane. We can slide figures around the plane without changing them, and we can turn them around some fixed origin point, but I don’t allow flipping them over. Sliding gives a group of translations and turning gives a group of rotations around the origin. Sliding and turning don’t commute: turning a triangle by 90° around the origin and moving it right an inch is different than moving it right an inch and turning it 90° around the origin. However, conjugating a translation by a rotation gives another translation, so the group of Euclidean motions is the semidirect product . Another example that comes up is the wreath product, where is some subgroup of a permutation group , and is the direct product of copies of a group . We take the action of on to be permutations of the factors in the product: . This one will be useful to us soon. One last note: as I was thinking about semidirect products in preparation for this post I was trying to determine if there is a universal property for them, like there is for the direct product. I asked a few other people too, and nobody seems to have a good answer. Since I know a few professionals are reading, does anyone know of a universal property that characterizes the semidirect product ? I was thinking that one thing might have been unclear in my discussion of free products. The two groups in the product must be completely disjoint — there are no elements in common. Particularly, if we take the free product we must use two different — but isomorphic — copies of . For example, in we might take the first copy of to be permutations of , and the second to be permutations of . This diagram looks a lot like the one for free products, but it has the group up at the top and homomorphisms from into each of and , and we insist that the square commutes. That is, we send an element of into and on into or we can send it into and on into , and the result will be the same either way. In many cases will be a common subgroup of and , and the homomorphisms from are just the inclusions. So how do we read this diagram? We start with three groups and two homomorphisms — — and we look for groups that “complete the square”. The amalgamated free product is the “universal” such group — given any other group that completes the square there is a unique homomorphism from to . Just like for free products we’ve given a property, but we haven’t shown that such a thing actually exists. First of all there should be a homomorphism from to by the universal property of . Then we have two ways of sending into : send to sitting inside or send it to inside . Let’s call the first way and the second way . Now we want to add the relation for each element of . That is, should be the identity. It isn’t the identity in , but we can make it the identity by taking the smallest normal subgroup of containing all these elements and moving to the quotient . This is the group we’re looking for. We’ve shown that does complete the square. Now if is any other group that completes the square it has homomorphisms into it from each of and , so there’s a unique homomorphism . But now sends every element of to the identity in because we assumed that makes the outer square in the diagram commute. Since is in the kernel of we get a well-defined homomorphism from to , which is the one we need. Amalgamated free products will become very important somewhere down the road, especially because they (and related concepts) figure very prominently in my own work. On Tuesday I talked about how to put a group structure on the Cartesian product of two groups, and showed that it satisfied a universal property. For free products I’m just going to start from the property. First, the picture. This is the same diagram as before, but now it’s upside-down. All the arrows run the other way. So we read this property as follows: Given two groups and , the free product is a group with homomorphisms and so that given any other group with homomorphisms and there is a unique homomorphism . The exact same argument from Tuesday shows that if there is any such group , it is uniquely determined up to isomorphism. What we need is to have an example of a group satisfying this property. First of all, has to be an monomorphism. Just put itself for , the identity on for , and the trivial homomorphism (sending everything to the identity) for . Now anything in the kernel of is automatically in the kernel of the composition of with the coproduct map. But this composite is the identity homomorphism on , which has trivial kernel, and so must . This means that a copy of must sit inside . Similarly a copy of must sit inside . So how do those two copies interact? Let’s put in for and let send everything in to some power of the generator — effectively defining a homomorphism from to — while sends everything in to some power of the generator . If there’s any relation between the copies of and sitting inside , it won’t be respected by the function to required by the universal property. So there can’t be any such relation. is actually very much like , only instead of alternating powers of and , we have alternating members of and . An arbitrary element looks something like . Of course it could start with an element of or end with an element of . The important thing is that the entries from the two groups alternate. We compose by just sticking sequences together like for a free group. If one sequence ends with an element of and the next sequence starts with an element of , we compose those elements in so the whole sequence is still alternating. Does sit inside here? Of course! It’s just sequences with only an element of in them. The same goes for . And given any group and homomorphisms and , we can send to . That’s our . As I said above, any other group that has this property is isomorphic to , so we’re done. If we compare the free product with the direct product , we see that the main difference is that elements of and don’t commute inside , but they do inside . We can check that . In fact, take a presentation of with generators and relations , and one of with generators and relations , and with and sharing no elements. Then has generators and relations , while has generators and relations . Since we’ve only added some relations to the presentation to get from to , the latter group is a quotient of the former. There should be some epimorphism from to . I’ll leave it to you to show that some such epimorphism does exist in two ways: once by the universal property of and once by the universal property of . There are two sorts of products on groups that I’d like to discuss. Today I’ll talk about direct products. The direct product says that we can take two groups, form the Cartesian product of their sets, and put the structure of a group on that. Given groups and we form the group as the set of pairs with in and in . We compose them term-by-term: . It can be verified that this gives us a group. There’s a very interesting property about this group. It comes equipped with two homomorphisms, and , the “projections” of onto and , respectively. As one might expect, , and similarly for . Even better, let’s consider any other group with homomorphisms and . There is a unique homomorphism — defined by — so that and . Here’s the picture. The vertical arrow from to is , and I assert that that’s the only homomorphism from to so that both paths from to are the same, as are both paths from to . 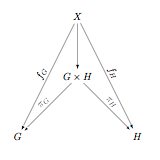 When we draw a diagram like this with groups on the points and homomorphisms for arrows, we say that the diagram “commutes” if any two paths joining the same point give the same homomorphism between those two groups. To restate it again, has homomorphisms to and , and any other group with a pair of homomorphisms to and has a unique homomorphism from to so that the above diagram commutes. This uniqueness means that has this property is unique up to isomorphism. Let’s say two groups and have this product property. That is, each has given homomorphisms to and , and given any other group with a pair of homomorphisms there is a unique homomorphism to and one to that make the diagrams commute (with or in the place of ). 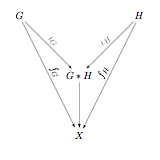 Then from the diagram with in place of we get a unique homomorphism . 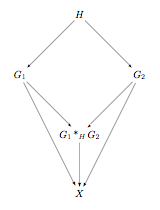 On the other hand, from the diagram with in place of , we get a unique homomorphism . Putting these two together we get homomorphisms and . Now if we think of the diagram for with itself in place of , we see that there’s a unique homomorphism from to itself making the diagram commute. We just made one called , but the identity homomorphism on also works, so they must be the same! Similarly, must be the identity on , so and are inverses of each other, and and are isomorphic! So let’s look back at this whole thing again. I take two groups and , and I want a new group that has homomorphisms to and and so any other such group with two homomorphisms has a unique homomorphism to . Any two groups satisfying this property are isomorphic, so if we can find any group satisfying this property we know that any other one will be essentially the same. The group structure we define on the Cartesian product of the sets and satisfies just such a property, so we call it the direct product of the two groups. This method of defining things is called a “universal property”. The argument I gave to show that the product is essentially unique works for any such definition, so things defined to satisfy universal properties are unique (up to isomorphism) if they actually exist at all. This is a viewpoint on group theory that often gets left out of basic treatments of the subject, but one that I feel gets right to the heart of why the theory behaves the way it does. We’ll definitely be seeing more of it. Now it’s time for the reason why free groups are so amazingly useful. Let be any set, be the free group on , and be any other group. Now, every function from into extends to a unique homomorphism . Just write down any word in , send each letter into like the function tells you, and multiply together the result! So what does this get us? Well, for one thing every group is (isomorphic to) a quotient of a free group. If nothing else, consider the free group on the set of itself. Then send each element to itself. This extends to a homomorphism from to whose image is clearly all of . Then the First Isomorphism Theorem tells us that is isomorphic to . That’s pretty inefficient, but it shows that we can write like that if we want to. How can we do better? I want to throw out a few more examples of groups before I move deeper into the theory. First up: Abelian groups. These are more a general class of groups than an example like permutation groups were. They are distinguished by the fact that the composition is “commutative” — it doesn’t matter what order the group elements come in. The composition is the same as the composition . All the groups I’ve mentioned so far, except for permutations and rotations, are Abelian. It’s common when dealing with an abelian group to write the composition as “+”, the identity as “0”, and the inverse of as . Let’s recap the axioms for an Abelian group in this notation. Abelian groups are really fantastically important. Many later algebraic structures start with an Abelian group and add structure to it, just as a group starts with a set and adds structure to it. We’ll see many examples of these later. The other thing I want to mention is a free group. As the name might imply, this is a group with absolutely no restrictions other than the group axioms. We start by picking some basic pieces, sometimes called “generators” or “letters”, and then just start writing out whatever “words” the rules of group theory allow. Let’s start with the free group on one letter: . We definitely have the identity element — written “1” — and we throw in our single letter . We can compose this with itself however many times we like by just writing letters next to each other: , , , and so on. We also need an inverse, . We can use and to build up long words like . But notice that whenever an and an sit next to each other they cancel. That collapses this long word down to . We see that in all words look like , where a positive means a string of s, a negative means a string of s, and for the identity. We compose just by adding the exponents. The free group on two letters, gets a lot more complicated. We again start with the identity and throw in letters and . Now we can build up all sorts of words like . But now we can’t do anything to pull and past each other. Letters only cancel their inverses when they’re right next to each other, so this word only collapses to . That’s the best we can do. Free groups on more generators are pretty much the same, but with more basic symbols. Composition of words and just writes them one after another, cancelling whatever possible in the middle. For example, in let’s say and . We write them together (in order!) as and cancel inverses where we can to get . Free groups seem hideously complicated at first, but they aren’t so bad once you get used to them. They’re also tremendously useful, as we’ll soon see. They’re the primordial groups, with absolutely nothing extra beyond the bare minimum of what’s needed to make a group. What is the inverse of a word in a free group? What should the free Abelian group on letters look like? UPDATE: Since I noticed later that the convention that makes things simplest in group actions is to compose permutations right-to-left, I’ve gone back and tweaked that here. A good ramp up into abstract algebra is the idea of a group. Groups show up everywhere in mathematics, and getting a feel for working with them really helps you learn about other algebraic notions. There are a number of ways to think about groups, but for now I’ll stick with a very concrete, hands-on approach. This is the sort of thing you’d run into in a first undergraduate course in abstract (or “modern”) algebra. Composition is associative. That is, if we have three elements , , and , the two elements and are equal. There is an identity. That is, there is an element (usually denoted ) so that . Every element has an inverse. That is, for every element there is another element so that .